During our trip around managed pointers and structs, we get the last topic to discuss – readonly semantics. Thus, we touch today topics like readonly structs and readonly paremeters. Ref types are quite powerful, because we may change its target. Thus, readonly refs were introduced in C# 7.2 that controls the ability to mutate the storage of a ref variable. for value type target – it guarantees that the value will not be modified. As the value here is the whole object (memory region), in other words, it guarantees that all fields will not be changed. for reference type target – it guarantees that the reference value will not be changed. As the value here is the reference itself (pointing to another object), it guarantees that we will not change it to point to another object. But we can still modify the properties of the referenced object. Among many things that are coming with the upcoming C# 8.0, one perfectly fits the topic of ref structs I’ve raised in my previous post – disposable ref structs. Disclaimer – this article consists of fragments of my book, adapted and re-edited considerably to be presented in the form of an independent whole post. As already explained in the previous article, managed pointers have their well-justified limitations – especially in that they are not allowed to appear on the Managed Heap (as a field of reference type or just by boxing). However, for some scenarios, it would be really nice to have a type that contains a managed pointer. The main motivation behind such type is Span<T> – which should be able to represent references “inside” objects (interior pointers), stack address or even unmanaged memory. unmanaged pointers that may be cast back and forth for literally everything. This is also why managed pointers do not offer pointer arithmetic known from raw pointers – it particularly does not make sense to “add” or “subtract” addresses they represent, pointing to various places inside objects or to local variables. Hi all! I am thrilled to announce that after more than two years of intensive book writing, it is finally available for preorder! 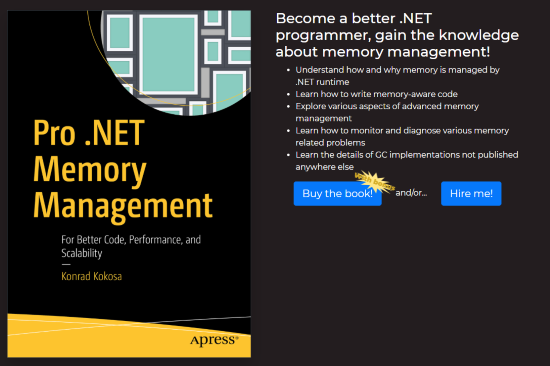 Its about 800 pages are solely dedicated to the topic of .NET memory management and its Garbage Collector. With many, many internal workings of all this. I believe, personally, that there is currently no single book or even finite set of articles online that give so comprehensive insight into this topic. 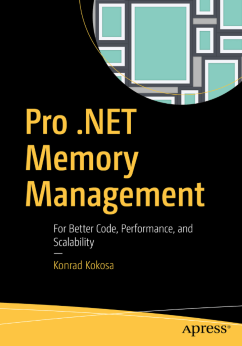 As a person who sincerely loves .NET and related performance topics – and spent quite a lot of time diagnosing various .NET memory-related issues – I’ve just needed to write such book. And as it covers all recent changes in .NET Core 2.1 (including Span, Memory or pipelines), I believe there is no better time to publish such book! This blog post was written as part of the preparations while writing the book about .NET, which will be announced in a few weeks. If you want to be informed about its publication and receive auxiliary materials, feel free to subscribe to my newsletter. Many thanks to Stephen Toub that helped in reviewing this code. Async programming becomes more and more popular. While being very convenient in use, from performance perspective there are scenarios where regular Task-returning async methods have one serious drawback: they need to allocate a new Task to represent the operation (and its result). Such heap-allocated Task is unavoidable in the truly asynchronous path of execution because async continuations are not guaranteed to be executed on the same thread – thus the operation must persist on the heap, not on the stack. But what if we were able to not heap-allocate Task even in case of an asynchronous path? This may be useful in very, very high-performance code, avoiding async-related allocations at all. As already said, something on the heap must represent our async operation because there is no thread affinity. But why not use heap-allocated, pooled objects for that, reused between successive async operations? Thanks to pooling, even on the asynchronous path there will be no allocations (at least most often, if our pool is used efficiently). We can await such method in a regular way and underlying machinery will take care of it. Note. If you would like to hear more about Task, ValueTask and IValueTaskSource again, in similar but other words, please look at great Task, Async Await, ValueTask, IValueTaskSource and how to keep your sanity in modern .NET world post by Szymon Kulec. Seems easy, right? Read on to see if it really is! All source code described here is available in my PooledValueTaskSource repository on GitHub. There are quite many comments in the code but this post explains most relevant parts as well. Do not be also surprised with many diagnostic Console.Write in this code – it serves to illustrate the internal working of this class in prepared example program (also available in the repository). In my custom implementation, I use object pooling based on ObjectPool class based on the internal class taken from Roslyn source code and a little refactored (with renaming mostly) – I’ve omitted it here for brevity as not so relevant. From our perspective here there are obvious Rent and Return methods, period. and AsyncIOOperation in ASP.NET IIS Integration code. What I’ve tried to do is to provide Minimal Valuable Product that is correct and working (stripping as much as possible from the mentioned code). My custom IValueTaskSource represents an operation that returns a string that is being read from the provided file. Obviously, one would probably like to introduce a more generic class with generic result type and action being provided as a lambda expression. However, to not clutter such example too much, I’ve decided to prepare it in such “hardcoded”, specific scenario. Feel free to contribute more generic versions! // Lost the race condition and the operation has now already completed. // captured it, we can just ignore the one we captured. This concludes implementing IValueTaskSource methods but we need to add two more crucial pieces into this puzzle: a method that starts our operation and method that is called when an operation completes asynchronously. // Opearation not yet completed. Return ValueTask wrapping us. // OMG so happy, we catch up! Just return ValueTask wrapping the result (returning ourselves to the pool). I’ve implemented here simulation of some operation that may both complete immediately (synchronously) and asynchronously. In case of asynchronous path, returned ValueTask pass the result so we avoid allocations again. In case of asynchronous case the key is to return ValueTask that wraps… ourselves. It may be then awaited on, while we also started asynchronous processing (simulated by thread pool work in our case). // explicitly uses the awaiter's OnCompleted instead. And… only such little code is necessary to avoid heap-allocating in case of async operations! I do not claim that my code in current form is ideal. Quite opposite, I still expect it to be by far ideal! It serves as an illustration and base for further development. Please, feel invited to comment and to contribute to making it better! Current repository is oversimplified – due to the work on the book, I do not have time to reorganize it properly (especially include comprehensive unit tests). Again, feel free to contribute!